I'm finally getting back into my kitchen groove with a healthy twist! Tonight I'm solo for dinner while the hubby is working. 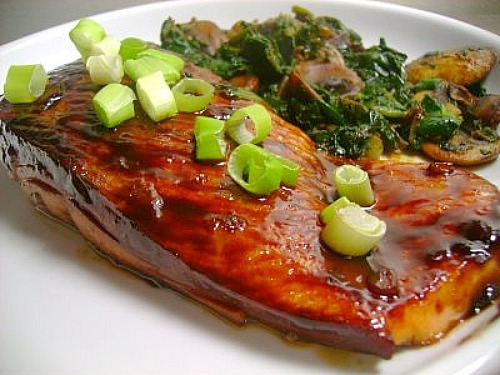 So for dinner, I enjoyed a flavorful and healthy dish of honey teriyaki salmon which I served with sauteed spinach and caramelized mushrooms. So simple and delicious! Oh... and with an effort to get better quality pictures, hopefully some of the changes I've made will try to do a little justice to the recipes I prepare! Place all the ingredients in a zip-close plastic bag. Squeeze out the air and seal the bag; turn to coat the salmon. Refridgerate, turning the bag occassionally, at least 6 hours or up to 24 hours. Spray the grill rack with nonstick spray. Preheat the grill to medium-high or prepare a medium-high fire. Alternatively, spray a large nonstick skillet with nonstick spray and place over medium-high heat. 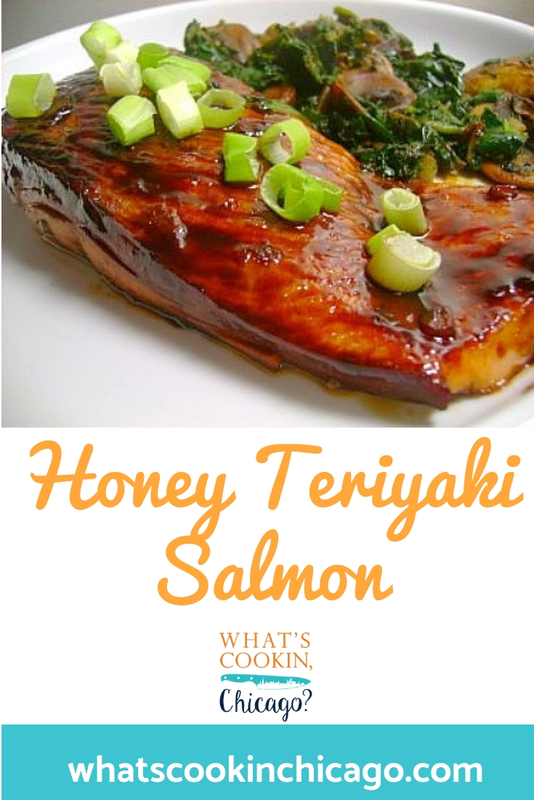 Remove the salmon from the marinade; discard the marinade. Place the salmon on the grill rack. Grill until the salmon us just opaque in the center, 4-5 minutes on each side. Alternately, place the salmon in the skillet and cook until the salmon is just opaque in the center, 4-5 minutes on each side. I'm in awe of how sticky and thick that glaze looks! I habitually burn glazes. Did you do this on the stovetop? I'm not a fan of salmon, but this looks ridiculously delicious! Wow. This looks so tasty. I will have to give that glaze a try. That looks so good! I'm definitely making this one. Looks delicious! I love salmon, but once it gets cool outside and I have to cook it inside my husband won't allow it... it always leaves an odor in the house! I'm drooling on my keyboard- that looks amazing! I have to admit, I don't usually make my own teriyaki sauce(shame on me) but your photo really inspires me to give it a try! I love it. This looks like one tasty salmon! I love salmon and this looks delicious! Your picture is mouth-watering! I made this tonight and it was really good. Mine didn't end up having all that extra sauce on it - maybe because I cooked it under the broiler? It was really good though, will make again!